↑ "Arundhati Roy". Bookclub. 2 ᱚᱠᱴᱚᱵᱚᱨ 2011. BBC Radio 4. Retrieved 18 ᱡᱟᱱᱩᱣᱟᱨᱤ 2014. ↑ "Arundhati Roy". Encyclopaedia Brittanica. Retrieved 12 ᱢᱮ 2013. ↑ Dhanusha Gokulan (11 ᱱᱚᱵᱷᱮᱢᱵᱚᱨ 2012). "'Fairy princess' to 'instinctive critic'". Khaleej Times. Retrieved 2014-11-02. ↑ "Arundhati Roy, 1959–". The South Asian Literary Recordings Project. Library of Congress, New Delhi Office. 15 ᱱᱚᱵᱷᱮᱢᱵᱚᱨ 2002. Archived from the original on 4 ᱮᱯᱨᱤᱞ 2009. Retrieved 6 ᱮᱯᱨᱤᱞ 2009. ↑ "Notable Books of the Year 1997". New York Times. 7 ᱰᱤᱥᱮᱢᱵᱚᱨ 1997. Archived from the original on 9 ᱰᱤᱥᱮᱢᱵᱚᱨ 2008. Retrieved 21 ᱢᱟᱨᱪ 2007. ↑ David Barsamian (ᱥᱮᱯᱴᱮᱢᱵᱚᱨ 2001). 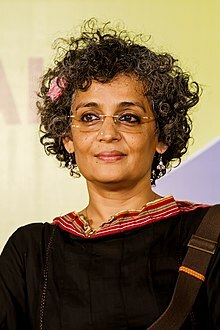 "Arundhati Roy interviewed". The South Asian.